The current Ebola outbreak in Sierra Leone, Liberia and Guinea is a tragedy for those countries and the thoughts of everyone at KickStart Ghana is with those families that have been affected. We want to make sure that our supporters and volunteers are up to date with what the situation is in Ghana and that’s why we’ve created a KickStart Ghana Ebola factsheet. Of course, this isn’t an exhaustive list of answers but we hope it reassures people and gives them an insight in to our response. 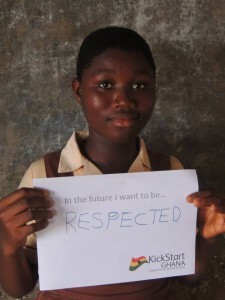 A new post from our blogger Emily Laramy on girl’s rights and why they are so important. Across the globe, girls’ rights are threatened. Worldwide 250 million girls live in poverty. Growing up in poverty exposes girls to multiple vulnerabilities, in fact by the age of 12 a girl in poverty is at high risk. In the developing world, one in seven girls are forced into marriage by their 15th birthday. Marrying this young makes girls 5 times more likely to die in childbirth. Girls are also vulnerable to domestic and sexual violence with nearly half of all sexual assaults worldwide taking place against girls aged 15 and younger. Today is International Day of the Girl. Not only am I deeply passionate about protecting children’s rights, I am also a fervent advocate for women’s rights. I strongly believe that if we invest in girls we can create an incredible ripple effect that will bring about a powerful lasting change. Providing a girl with access to education, vocational training, health care and a safe environment free of violence, gives her the potential not only to raise her standard of living , but also that of her family and her community. Whether it is deciding how the household income is spent or determining how the country is run, women have the right to an equal say in all matters that impact on their lives and how we invest in girls is key. In the developing world, 1 in 5 girls don’t currently attend school. Through KickStart Ghana’s work, children receive educational opportunities, including access to better school facilities, literacy skills, and equipment. Studies show that if a girl receives 7 years of education, on average she marries 4 years later. Furthermore, for every year of schooling her earning power increases by 10% to 20%. Want to change the world? Invest in the lives of girls, making their education a top priority.